Many of you don’t know me, but I know you. My husband, Vinnie, talks about you like you are family. His readers of Off the Block mean the world to him. You may not know this, but Vinnie does not get to pursue his passion for his 9-5 job. He is adamant that he does not want the volleyball community to pay to access his coverage. So from a few sponsors, some ads and your generous donations Off the Block breaks even. I got the great pleasure to meet so many of you on Saturday and Sunday at the Grow the Game Challenge. And the kind words blew me away. Fred Battenfield, the coach for North Greenville said it best, “How do you thank someone for doing something like this?” Well, cash is nice but we will also accept diapers and baby swag. 😉 But really, your words and continued support as a community is enough for us. Now, Off the Block never set out to make money or run tournaments. Honestly, it was my idea to start OTB. Vinnie needed a creative outlet, he needed to be back in the volleyball world and I was tired of hearing him talk about it all the time. We never thought that a little hobby would explode like it has and we only have you, the readers, to thank. The Grow the Game Challenge was a leap for Vinnie. Maybe the leap was too far. But, as a mentor of mine and Vinnie’s always told us, don’t be afraid to fail. When we are afraid to fail we play it safe and nothing grows out of being safe. So we took a leap. With that leap came sleepless nights (which, maybe it was ok they were sleepless… we do have an infant after all), hundreds of emails, endless details, joy and disappointment. Oh, and on top of all of it snow and ice shut down Nashville as the tournament kicked off. All of that being said, I would like to thank a few people publicly for helping Vinnie get this dream off the ground, for helping him Grow the Game, for taking a chance and not letting him do this alone. Wade Garard and MotorMVB- Thank you for believing in Vinnie and supporting him, both financially and emotionally. Your words have been priceless to Vinnie and calming his anxiety, and therefore they are priceless to me. Thank you for being committed to Growing the Game of boys’ and men’s volleyball. We hope this is not our last endeavor together. 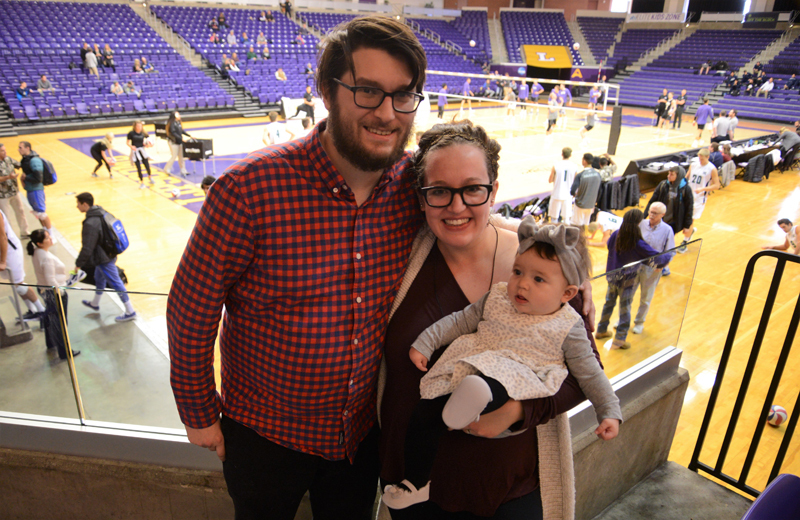 Brandon and the Lipscomb University Women’s Volleyball Team- You took the first chance by going to bat (is there a volleyball metaphor for this… I guess not…) for Vinnie. I know it is not easy to do that. You trusted him, you took up for him and you helped fill the gaps. Thank you. The coaches and players- You came! You rolled with the weather issues and you said yes to my husband’s dream! Even those who didn’t come, thank you. Thank you for taking his calls and for always talking volleyball so I don’t have to. Even those of you who didn’t make it to Nashville, you support Off the Block in so many ways. This dream is a reality because of you! The fans- You make Off the Block possible. You are why Vinnie does this and you continue to floor us with your support. Thank you for helping us Grow the Game! Dave Derocher- Thank you for being our local support. And thank you for the prayers. Those mean the most and bring tears to my eyes as I type this for more reasons than I will share with the world. Anthony & Jay- Thank you for willingly and joyfully offfering your talents (for far less than they are worth) and being such good friends and cheering Vinnie on. Clay- For the pop and filling in the gaps willingly. Jonathan- You are Vinnie’s right hand and jumped into help with OTB just because you love the game as much as him. I wish with all my heart we could pay you a fraction of what you are worth to our family. I know, you didn’t have anything to do with the tournament, but I can’t say thank you for OTB and not include you. And with that, we are handing the keys of Off the Block over to Jonathan for the week, giving me one more reason to thank him. Leaving Off the Block in such capable hands is so great for our family. So, for his health and the health of our new little family we are taking a hiatus – because Growing the Game is exhausting. Thank you for your continued support and thank you for respecting our time to catch our breath. Vinnie will see you all back online next week.